I love adding a little splash of summer to my kitchen whether it’s with fresh flowers, colorful vases, or cute tea towels. I’ve made several summer tea towels lately using fruit for inspiration. 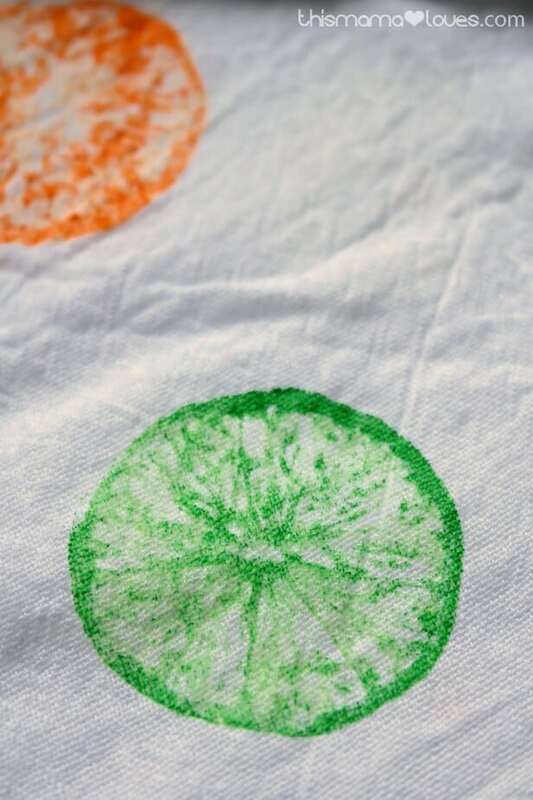 These Citrus Stamped Tea Towels are my favorite. They also make a great, inexpensive hostess gift too! Apply a small amount of paint to a throw away plate. I used several colors. Lay the towel out with newspaper or paper towel underneath to protect your work surface. 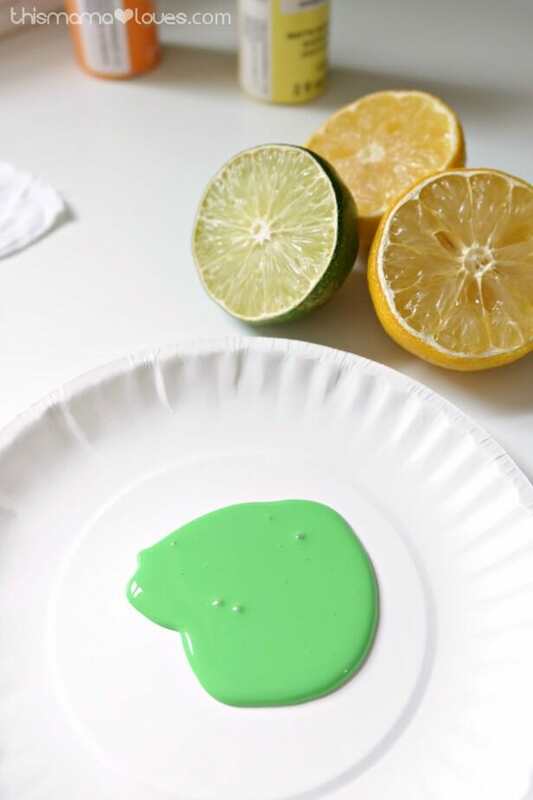 Dip the fruit half into the paint and gently blot the access paint onto a paper towel or piece of news paper. You may want to use a foam paint brush to apply the paint, leaving it a little heavier on the edges. Gently press the painted fruit against the towel. If the paint is too thick the stamp will not look like your citrus fruit. If the paint is too thin the stamp will be too faint. I recommend practicing on a paper towel several times to make sure you have your technique just how you want it. I added the stamps along the bottom and one side of the towel to create a border. Be sure to allow the paint to dry completely before folding or washing. 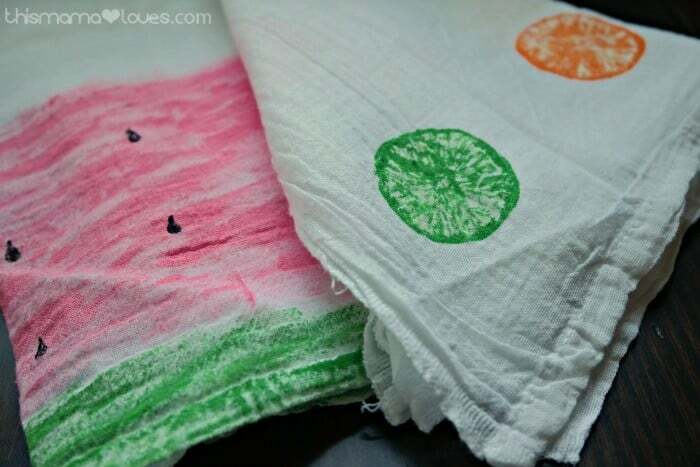 I also made a watermelon inspired tea towel by painting the bottom several inches pink and adding a green border to the edge. I added “seeds” with a black paint pen. It turned out cute too! 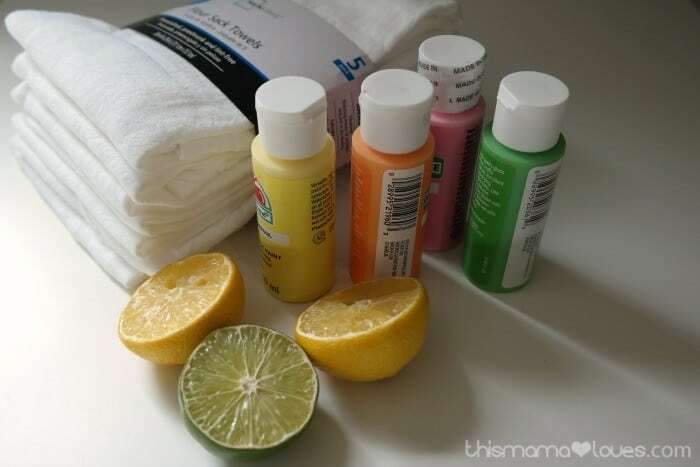 Get creative and mix and match the fruit inspired towels with bright solids or stripes. They’re a great way to brighten up the kitchen for summer! This is a great idea, I should save up our dried lemons/limes for a little wall art project for my kids to do, thank s for sharing! These are really spectacular! Never would have thought to use fruit as a stamp! Thank you for sharing your awesome creativity with us at Brag About It! I love your towels! I am a huge fan of citrus! I love citrus flavors and citrus decor 🙂 Thanks for the beautiful inspiration! These are so cute! I love that you can really personalize them, too. I’m sure they’d make great, relatively inexpensive gifts! Such a great idea and super cute — I’ve used this for wrapping paper but never thought to use tea towels — love them! Thanks for sharing! Cool this is a craft for my niece. Wow these came out so nice! It would be a fun activity for a get together, too! These towels are so cute! 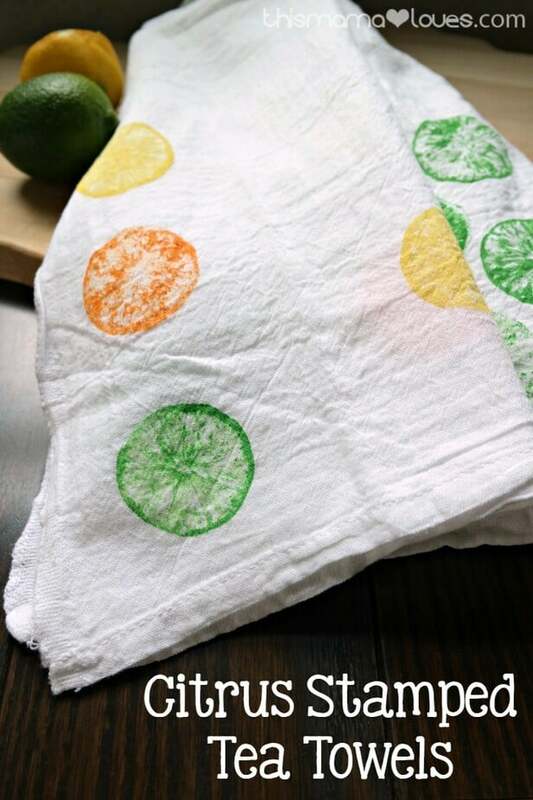 They do look like fun to make with the citrus stamps. I like flour sack towels because they are so soft. I want to make these! That looks fun and easy to make! Cute idea! 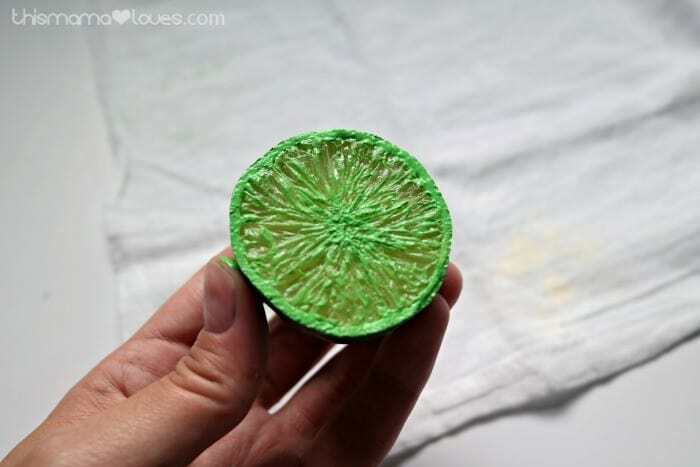 Very cool and thrifty that you used real limes for the stamping part, awesome cute towels for a summery touch in the kitchen. Oh my gosh, that is the cutest thing ever, and so easy! This truly is a great gift that is inexpensive, but will be well appreciated. This is such a really cute idea! Making a tablecloth like this would be cute too.